First things first: I love, LOOOVE a good before and after! It's the dangling carrot that keeps me going and feeling inspired. If someone can turn that into that, then my projects don't seem so intimidating and I get a tingling "I can do anything" sensation. And you know what? It feels good... So good, I want to spread the joy to everyone. If you'd like that same tingly feel-goodery, then follow the carrot to this awesome Scandinavian Modern kitchen renovation! Well, it's not a Before and After because we don't have the Before photos. All I know is that this California kitchen belonging to Samantha and Barry Nugent is not only stunning, but you can copy some of these elements to get a similar look. The design is simply impeccable. I would be out there painting my kitchen cabinets gray tonight if I didn't have that gosh darn black granite. This is what I have now, it's the BEFORE. I've posted about other people's powder room re-dos, but now it's my turn. When I first did this powder room, I truly believed I would NEVER want to change it. The soft gray walls, black and white photos, white pedestal sink and toilet, hardwood floors and the then-so-chic shiny brass fixtures. Cramped, dark and dated. These three words describe a lot of kitchens out there. Like the one pictured above, for example, which overlooks the St. Croix River Valley in beautiful Minnesota. The owners wanted bigger, lighter and contemporary, but they didn't want to add budget-blowing square footage to their home's footprint. Instead, designer Laurie Butler opened it up by taking out the soffits and hanging cabinets. To gain more space, she converted two closets; one became a pantry and the other a recess for two wall ovens. In two days, this perfectly acceptable kitchen went from bland to BAM. Monday morning jolt--get a load of this kitchen Before and After performed by Leah in her 1920's Philadelphia home. Look at this crisp kitchen makeover. Cheerful Kitchen Makeover with Fabric Covered Cabinets. 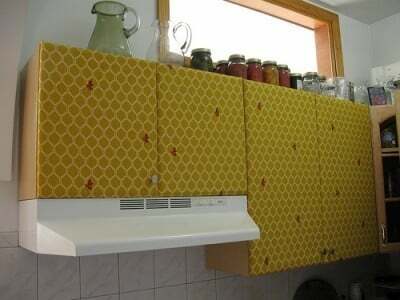 With just a few thumbtacks, some ScotchGuard spray, and a screwdriver, Veronique made her kitchen, like, a thousand times happier with this brilliant, whydidn'tIthinkofit project: fabric covered cabinet doors. Simply take down your doors for use as a pattern, adding one inch to all sides, and secure with thumbtacks, wrapping it like a gift. Spray, secure, smile. Via.